Mike Bennett Author: Underwood and Flinch in the Audible Store! At last! 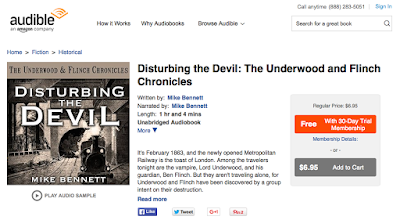 Underwood and Flinch: Disturbing the Devil is available from the Amazon Audible Store, and from iTunes. Having processed the audio file to Audible specifications about two weeks ago, I just got the notification email through today. I'm delighted to finally see my stuff in the Audible store. Here's hoping it's the start of something exciting ... or at least something interesting ... though I'd settle for something awesome. Huzzah!! !